Whether you’re looking for a sit-down place or for pizza to go, the following 5 locations have fabulous offerings! 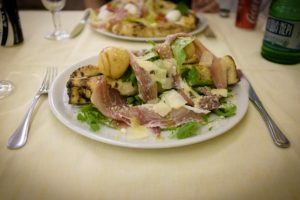 Each providing something different and unique, here is a handful of pizzerias in Rome you really shouldn’t miss. 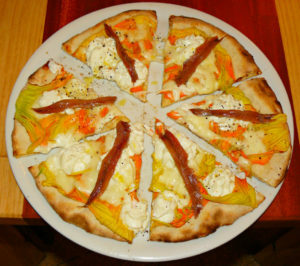 The uniqueness of In Fucina lies in it’s setup which is centered around “tasting.” For example, if there are 6 people at a table, 6 pizzas are ordered and the pizzas are brought out one at a time, already divided into equal shares. This method ensures that everyone eats one full pizza but not composed of slices of the same flavor. There are two advantages to this method: 1) Always serve hot pizza to everyone 2) Everyone gets to taste everything which makes it a real “tasting” journey. According to Edoardo Papa, owner of In Fucina, he is outside the normal pizza classifications because his pizza quality is superior and what he does is on a whole other level compared to the average pizza place. Though seemingly a pretty arrogant statement, once you try his pizza, you need no further convincing that this declaration is true. Maximum quality is found in every detail of the pizza here: All vegetables used are from local, organic, small-time farmers, all of the fish is caught locally and used the same day, all of their flour comes from small, Italian mills and they only use fresh, semi-wholemeal, type 1 flour. Using the best flour is part of Mr. Papa’s mission to provide a top-notch product. According to him, “most of the flours other pizza makers use are processed with steel cylinders at a very high speed which causes the grain to overheat, burning everything and robbing the grain of all it’s nutritional properties, causing it to taste like nothing.” Though not strictly a pizzeria, In Fucina’s pizzas are spectacular, boasting a menu of their regular pizzas and also specialty pizzas which change on a daily basis according to ingredient selection and availability. Originally from Amalfi, the owner, Mauro Di Palma serves pizza that strictly respects the neapolitan tradition of pizza making, thanks to the award-winning pizza chef, Marco Quintili who is himself neapolitan and has over 20 years experience in the pizza making business, including teaching at Tecnicamente, Pizza (one of the top pizza schools in Italy). Il Limoncello’s goal is to offer authentic products in the true Campania region style. They only use genuine buffalo mozzarella that is delivered fresh (even on Sunday mornings) to their location from the Campania region. They frown upon frozen products and nearly everything’s made in house. 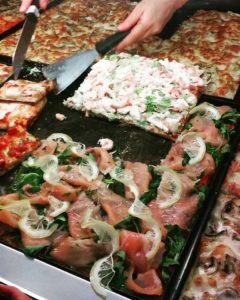 Not only do they have wonderful pizza, but their specialties also include a wide assortment of fish and meat dishes. All the pizzas here are great and the portions are very generous. For a real treat, be sure to try Il Rotolo, one of their pizza specialties. This newly opened restaurant is the brainchild of Riccardo di Giacinto and his wife, Ramona. For a long time they have been planning a locale that was a mixture of cultures, beauty, and flavors. Though this restaurant is not strictly a pizzeria and has a vast menu, the pizzas are definitely worth stopping in for. The name Madre or “mother” is a nod to the fact that it’s location is in a former convent of Dominican nuns and the yeast they use is lievito madre (the best quality yeast). Also the connection we have to the earth and Mother Nature. Lastly, because the locale and the staff are warm and welcoming, like a mother. Offering both red and white pizzas, there is no lack of delicious, good quality selection. For example, the Marinara pizza’s made with peeled Motticella tomatoes and Nardin anchovies. While the pizza alla Norma’s made with fresh eggplant and Salina capers. For a delicious white pizza, try the La Genovese pizza with pesto and pine nuts. Yum! Alice Pizza was founded in 1990 and is the entrepreneurial idea of Domenico Giovannini. 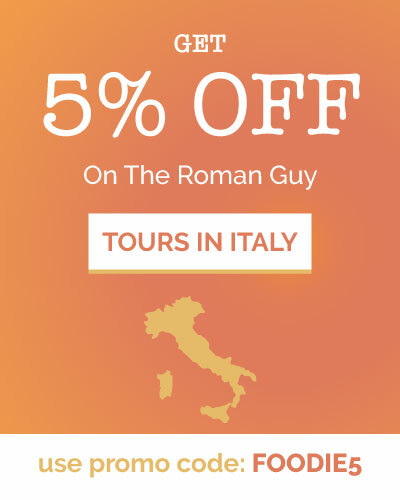 Since it opened, the company has come to expand throughout Italy, now with over 50 locations in Rome alone. Normally, any chain food can be written off as mediocre food for the masses, but thanks to Mr. Giovannini’s constant research of products and production techniques, Alice’s pizza (sold by the slice) has never lost its edge, specializing in pan pizza that’s not too thick, soft when you bite into it, but all the while maintaining a crispy bottom. Highly recommended is the cacio e pepe pizza, one of their many specialties. I l Gianfornaio was founded on the basis that baked goods are precious jewels and since the eighties, it has been providing high quality bread and pizza. The pizza is sourdough, light, digestible, and respects the Roman tradition of pizza crust: thin and crunchy. The original location’s in Ponte Milvio, but it has now grown to 5 different locations in the Eternal City. Known for it’s specialty bread and pizza by the slice, Il Gianfornaio also offers a wide range of delicious pastries. If the mood strikes you, they even offer an “apericena,” or happy hour where a drink. Not only that, but there’s also a vast selection of their products that you can sample. No matter what type of pizza you’re looking for, each place on this list offers something to meet your desires! 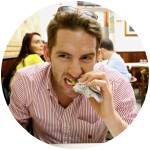 Next time you’re in Rome, don’t miss out on these excellent pizza interpretations the city has to offer…Happy eating!